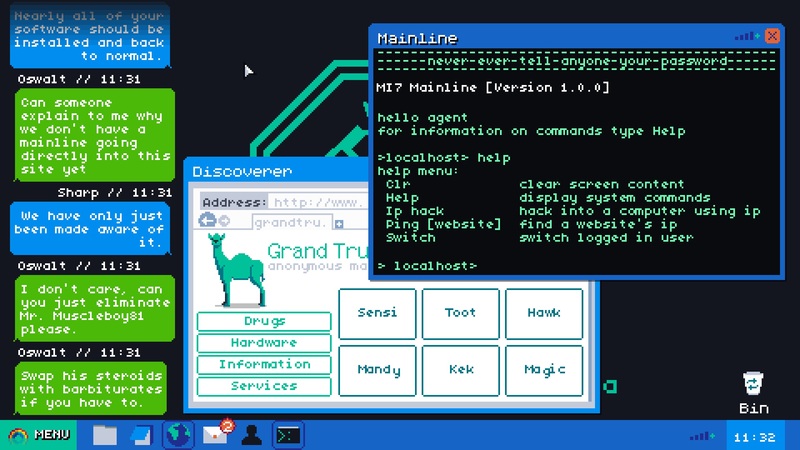 Kickstarter has seen a plethora of true political games in its history, and that trend continues with Mainlining, a point & click hacking adventure. 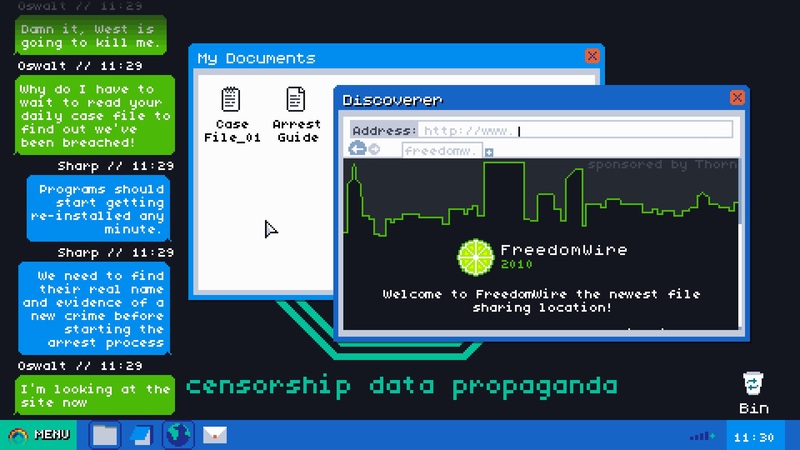 Whereas Need to Know took it’s gameplay queues from Papers, Please, Mainlining seems to follow more the Cibele or Her Story route, putting the player behind a computer. You play the role of an MI7 agent in the aftermath of a new piece of legislation passing. The BLU Pill Act allows the British government to access any and all online information of its citizens without the need of a warrant or a cup of tea. Mainlining actually mirrors real world events, as a similar – if not quite as aggressive – bill called the Investigatory Powers Bill is being discussed in Britain as we speak. It seeks to provide a glimpse into what life could look like if such a bill is passed. The aim of the game is to essentially spy on citizens. You have to hack into suspects computers, and use your own judgment and pre-existing knowledge to determine if or when to arrest the suspect. If you act too quickly, you might miss vital leads linking them to a larger terror plot, but if you act too slowly, they might realize you’re on to them and run. Or, you know, they might be completely innocent. Mainlining is being developed by highly experienced and successful people, working under the name Rebelphant. Founder and team lead Sam Read was highlighted in magazine Development as a “30 under 30,” someone under 30 years old to keep your eye on. Writing Mainlining is Jill Murry, who was nominated for a Writers Guild Award for her work on Assassin’s Creed IV: Black Flag. Providing the music is BAFTA Nominated musician Jared Emerson-Johnson, whose spent years working with Telltale Games. It’s safe to assume that these people know what they’re doing. The Kickstarter page has a breakdown, showing us where the $20,000 budget will go, mostly to various development departs and Kickstarter fees. There’s a public demo available, and you can bet I’ll be playing that next week. Mainlining just went live today, so you still have plenty of time to decide if you want to back the game or not. 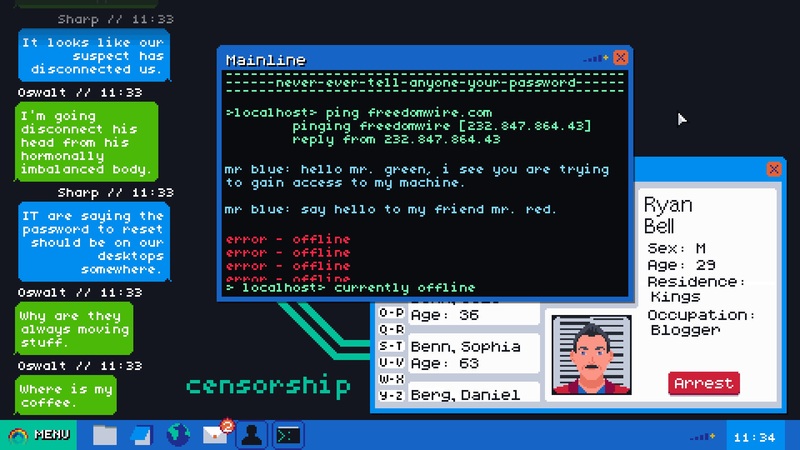 It’s got a great group of developers behind it, and from what I can see, the game looks like it’s going to nail both the humor, and the subtle creepiness of spying on your fellow citizens. I’m looking forward to it. Track the progress of the Mainlining Kickstarter in our Campaign Calendar.